ORLANDO, Fla. — There was a time when Sen. Lindsey Graham wasn’t attracting a crowd for his own 2016 presidential bid. Now he’s a bit of a rock star to the Republican faithful. The South Carolina Republican is nearing the end of a cross-country tour that will bring him to a dozen states on behalf of Republican House, Senate and gubernatorial candidates — and yes, under the auspices of the Republican National Committee, President Donald Trump. The tour took Graham to Florida on Friday, where he and Sen. Marco Rubio served as warmup acts for gubernatorial nominee and GOP Rep. Ron DeSantis at a morning event at a Republican victory office in Tampa. Graham then met up with Gov. Rick Scott, the Republican Senate candidate in a hotly-contested race that is currently in the Tilts Democratic column, according to Inside Elections with Nathan L. Gonzales. The members of the crowd, many of whom were wearing Trump’s red “Make America Great Again” baseball caps, were eager to take pictures with a man they’ve seen as a hero since his viral defense of Supreme Court pick Brett M. Kavanaugh at his Judiciary Committee confirmation hearing. “It parked an ‘enough’s enough’ kind of attitude when it comes to our judges, and I think it’s changed the dynamics. It united Republicans. Whether you’re a Bush guy, Trump guy, vegetarian, libertarian, you thought Kavanaugh — who was a Bush guy — was poorly treated,” Graham said. Scott, Graham and an assortment of statewide and local candidates rallied the Republican faithful to get out the vote at Skyline Attractions, a prominent roller coaster manufacturer here. What’s been particularly striking is Graham’s enthusiasm as he campaigns against incumbent Democrats whom he’s served alongside for years. In Florida, that’s Sen. Bill Nelson, a fellow longtime member of the Armed Services Committee. “Bill Nelson was not there when America, the rule of law, the Senate and Florida needed him the most,” Graham told the audience at Skyline Attractions. Graham soon after made clear he was referring to the Kavanaugh confirmation process. “Nobody on their side stood up and said a damn thing about it, and Rick called me right after the hearing, so it’s time for a change in Florida,” Graham said. He talked about the protesters who were present in the Capitol, and also railed against the more liberal parts of the Democratic Party. With the announcement Friday that the Trump administration would be reviving nuclear-related sanctions against Iran, Graham was also eager to talk about Nelson’s voting record on the Joint Comprehensive Plan of Action. 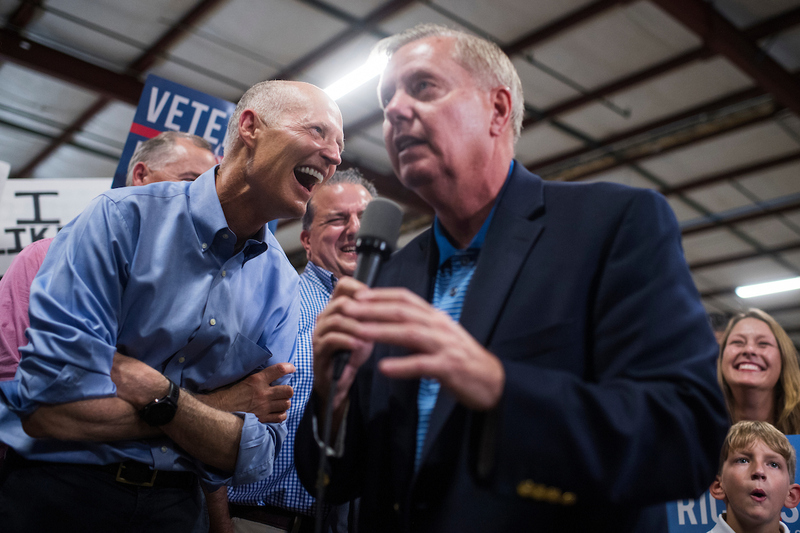 Graham brought up Iran as a key issue between Scott and Nelson during the rally, and walking in on an interview with Scott after the rally, Graham said he had identified it as one of three reasons he thought Floridians should vote for Scott next week. From here, Graham was set to accompany Scott to a campaign stop in Jacksonville before continuing his battleground travels. He was recently campaigning for Republican Senate candidates in Montana and Indiana, among other states. The event in Montana backing Matt Rosendale’s Senate campaign against incumbent Democratic Sen. Jon Tester apparently needed a larger venue. That probably should have been the case at the morning event with DeSantis in Tampa, where the local TV stations and still photographers were jockeying for position with supporters in the local office.